Today I am going to share an Instant Pot recipe with you! For those of you who don’t know, the Instant Pot is a 7 in 1 multicooker that is a: pressure cooker, slow cooker, rice cooker, saute-er, yogurt maker, steamer and warmer. I bought an Instant Pot last spring when my crockpot bit the dust. I had never used a pressure cooker before, but am amazed at how much I use it now. There is rarely a meal that is cooked in my house where the Instant Pot isn’t involved. One of my greatest resources for learning how to cook in the Instant Pot has been Jill Nussinow’s book – The New Fast Food. Jill, also known as “The Veggie Queen”, has written an extensive book detailing how to use a pressure cooker. She includes cooking chart, trouble shooting, and many other amazing resources…and that’s all before you get to the recipes. Jill’s recipes are all healthy, plant based meals that are spot on, and they make you a pressure cooking pro. I highly recommend her book! The best part is you can get it in e-book form – which means you can download it right away! Click here to visit The Veggie Queen. 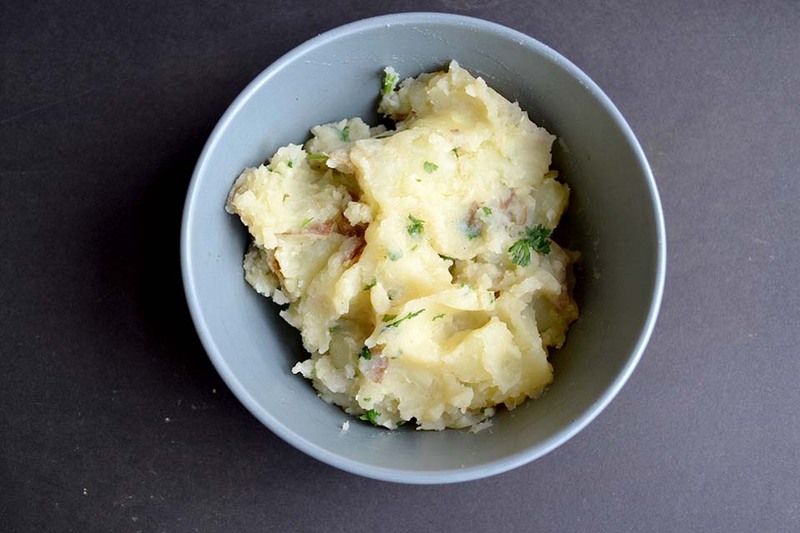 Alright – mashed potato pros – Let’s get cooking! This recipe can be found on page 112 of Jill's book - The New Fast Food. It is shared with her permission. Cut each potato into 8–12 chunks. Put into the cooker with the broth and the garlic. Close the lid and turn the steam valve to "sealed"
Click "Manual" and reduce the time to 4 minutes. When the instant pot completes the 4 minute cooking cycle, move the pressure valve to "venting" and allow the pressure valve to come down. Mash the potatoes with a masher or a hand blender. Depending upon the consistency you want, add all the soy milk or not. Add salt to taste and parsley and stir to combine. I also added black pepper to my potatoes! Thanks for doing some videos on Jills recipes…fun to watch and makes the recipes come to life. These videos are wonderful! Very professional yet accessible. I too love the “Magic Pot,” as my friend and I call it. It’s good to see how things are done in a video. I made soy yogurt following your instructions and it came it perfectly. Thanks for taking the time to produce these videos. Much appreciated. Thank you for the kind compliments, Margarite! 🙂 I am so glad you are enjoying the videos! Keep up the good work. I am new to the Instant Pot and I enjoy the videos. I followed your yogurt instructions and the yogurt turned out great. Hi Sheri! I am so glad you’re enjoying the videos!!! Thank you so much for letting me know! You can certainly increase the time if you’d like! I think they’re perfect after 4 minutes! Thanks for the response – I cooked the cubed potatoes at 5 mins and the still tasted uncooked but was a little mushy – weird. My instant pot pressure cooking recipe book says that cubed potatoes takes 7-9 minutes. Why is yours only 4? I did not write this recipe (It came from The New Fast Food book). I can insure you that they are definitely done after 4 minutes! I have found that the Instant Pot recipe book tends to overcook things a bit! I am so glad you enjoyed them, Corrie! That’s a great point about the size of the potatoes! 🙂 I get lazy when I cut them sometimes as well!! Well since I don’t really know how to cook I tried to cut them perfect and small knowing this would decrease cook time. Like 1/2 x 1/2 “. They still need like 7 mins. Weird – I dobt have the new IP too mine is two years old. Interesting, Missy! I think there are a lot of things that can effect the cooking! Luckily you now know the perfect time for you! Chelsea, THANK YOU THANK YOU! Finally, someone took the time to EXPLAIN and SHOW every step! Even AJ (she’s wonderful),but still did not show or explain in such detail as you did on the InstantPot. You see, when you’re new at this, it’s quite frightening. Even the manual didn’t explain step-by-step as you did. And that’s what a newbie needs! WELL DONE CHELSEA! Just got my InstantPot last week. I wanted to ask you, if you wanted to make DOUBLE or TRIPLE the amount, would you double and triple the liquids? And would you double and triple the time? I’m trying to figure out if the IP is like a microwave or not? In other words, does it work on volume like the microwave does? For instance, if you were to microwave one potato, then it might be 4 minutes and if two potatoes, then it’s like 7 minutes. Is the IP the same? Thanks SO MUCH Chelsea,.. job well done! Eek I’m so glad you enjoyed the video!! I love helping others understand the instant pot, so I’m always so happy to hear that the videos were helpful!! As far as doubling the recipe : I haven’t tried with this recipe in particular, but for most in the IP you double the ingredients and leave the cooking time the same. It’s going to take longer for the instant pot to come to pressure and to release pressure, because of the excess volume. Your one limit is the “max fill” line. You certainly don’t want to fill past this! Just made these for the first time . . . fabulous! Thanks Chelsea for the great video and thanks Jill for the delicious recipe. Fabulous, Catherine! I am so glad you enjoyed them!!! Thank you for taking the time to loop back and share your thoughts!!! I hope you have a fabulous rest of your weekend! Loved your video! Just got my Instant Pot and don’t know how to use it yet. I eat a no oil vegan diet. Do you have a potato leek soup recipe? Can you double ir triple the recipie in one cooking session? If so how does that affect cooking time? Hi Chelsea! I am pretty new to the Instant Pot. I got mine on Prime Day. Searching for instant pot recipes while I waited for it to get here is how I found your blog. I love your blog and your videos on Youtube. You have such a calming way of explaining things that is easy to understand while still quite entertaining. (Love that sense of humor!) I look forward to exploring more of your posts and videos. Thanks for sharing your work with us. 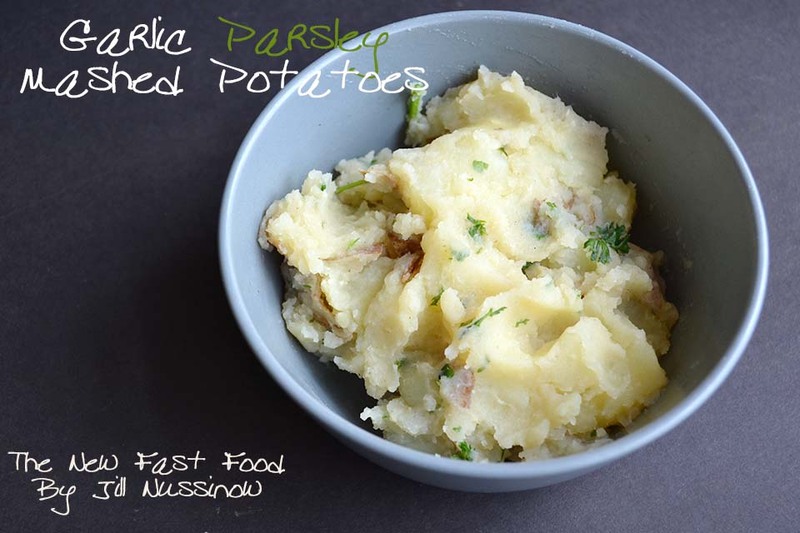 I’ll be making these Garlic Mashed Potatoes today. They look yummy. I wonder how many tablespoons of pre minced garlic would be equal to the amount in this recipe. Awe! This made my day, April! Thank you so much for the kind words!! I can’t wait to hear how to potatoes turned out! Typically I substitute 1/2 teaspoon minced garlic per 1 clove – I hope that helps! I noticed that this recipe is similar to the baked potato one, but the cooking times are way different. Is there an advantage.to having small chunks with less time over larger chunks with more time other than the cooking time savings? The small chunks definitely cook faster. It all depends on what you’re going to use the potatoes for! If you’re looking to enjoy a full baked potato, the small chunks just won’t cut it! Happy cooking! So, just to double check myself, if I started out with your baked potato recipe at 10 min (bigger chunks) these would still work to make into mashed right? Thank you so much. I am gluten free and I have a hard time finding recipes for my instant pot that are not fattening and greasy. Wow. These potatoes were the bomb. My family loved them, and so did I. My new go to quick and easy side dish. Thank you! I used five potatoes instead of four (and cooked them for 8 minutes). The mashed potatoes turned out really runny and liquidy — and I didn’t add any soymilk to them. Maybe I’ll use six or seven potatoes next time. Interesting! Perhaps the potatoes were a bit smaller? Just found this vid! Thank you. I am new to instant pot and love the way you thoroughly explained how to use it. Keep up the awesome work! Now to binge watch your other vids… hope there are lots. Hugs! !